How to calculate P(x1=1) for NADE Model? Consider the following NADE Model. The dimension of the shared parameters (W and b) are and . In addition we have and . Given , , . What will be the value of . Further given values and what will be the value of . I have gone through the theory of NADE but could not relate that to calculate the probabilities from these matrices. Please help me to solve this question. Browse other questions tagged deep-learning or ask your own question. FCN32 Model is not converging and loss is fluctuating after some points. Why? How to calculate caffe used parameters? How are matrices multiplied in Hierarchical Softmax model? 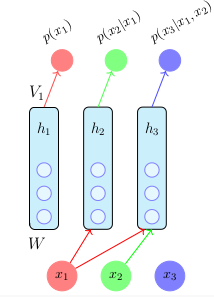 How to not re-initialize the pretrained loaded model in Tensorflow? What do you think doesn't have a gradient in this keras model?